In addition to courses at our school in Conil de la Frontera, we offer courses in Seville, the capital of Andalusia, and in O Grove, an attractive fishing town in Galicia. 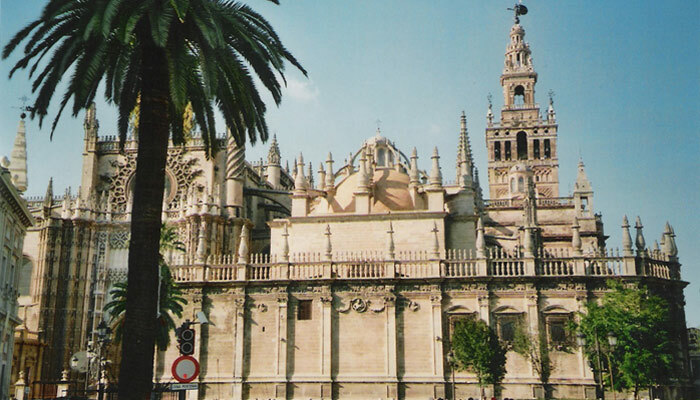 Seville, “The Beauty of Andalusia”, is deemed to be the most Spanish of all cities. Here as nowhere else you will find all those stereotypes automatically associated with Spain – flamenco, castanets, horse-riders, “sevillanas”. A land of ghostly processions and magic rituals and on a more practical level it is of course also an area justly famous for its fish and seafood, for its spectacular coastline and for its generous and friendly inhabitants. We have been cooperating with both these schools for many years and we can vouch for the quality of their teaching programmes. O Grove is wonderfully situated on a small peninsular. It has an Atlantic climate and temperatures are moderate throughout the year. In summer the weather is mainly dry, with temperatures between 22 and 33 degrees Celsius. Galicia has still not been discovered by international travel companies and has very few foreign tourists. The school in Seville is situated directly in the historic city centre. In this area there are countless narrow streets and alleyways, typical tapas and flamenco bars, street cafés with tables under the orange trees. Nearby flows the mighty Guadalquivir, adding a relaxing natural contrast to the flair of this mundane city. Our partner school in Seville enjoys an excellent reputation and is visited by students from many parts of the world. It is situated in the heart of the historic city centre. The school building is a traditional patrician palace. The classrooms are equipped with modern audiovisual systems and interactive whiteboards. The school is certified by the Instituto Cervantes, a guarantee of high quality. The lessons take place in a multicultural atmosphere. A wide range of cultural and free-time activities are offered, which afford a wealth of opportunities to get to know other students and make new friendships. One attractive possibility is to combine a Spanish course in Seville with a course in Conil. You will find details of special courses and combined courses in Seville and Conil in this PDF-file. We will also be pleased to put together an individual package to suit your requirements. Courses begin every Monday. Lessons are of 50 minutes duration. All levels from Absolute Beginners to Advanced are offered. Minimum age is 17. 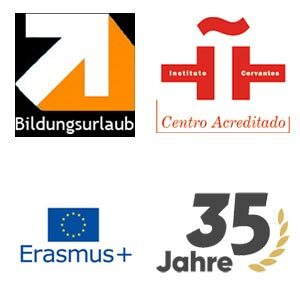 The Super-intensive course is recognized in many German federal states as “Bildungsurlaub”. All courses include a walking tour of the city on the first Monday, two optional classes of 100 minutes per week on History, Literature, History of Art, Phonetics and Pronunciation or Spanish Cinema. First course begins 08.01.2019, last course ends 20.12.2019. Courses are from Monday to Friday. Self-catering shared apartments Single or double rooms (these can only be booked by two people). Shared use of living room, kitchen and bathroom. Towels and bed linen are provided. Host families With breakfast, half or full board, single or double rooms (these can only be booked by two people). Included in the price are room cleaning, change of bedclothes and towels plus washing once per week. School hall of residence You live independently in a multicultural environment. Shared use of living room, kitchen and bathroom. Bed linen is provided. Wi-Fi-access is available. A deposit of 150€ is required. Private apartment Best quality accommodation at a reasonable price. Included in the price are towels and bed linen, Wi-Fi-access, heating air-conditioning and television. A deposit of 150€ is required. Arrive Sunday from 14:00, depart Saturday before 12:00. Prices for additional days’ stay available on enquiry. All accommodation is within 20 minutes walking distance from the school. Books are not included, each level approx. 20,00 €. You will find details of special courses and combined courses in Seville and Conil in this PDF-file. We will also be pleased to put together an individual package to suit your requirements. You will find details of school hall of residence and private apartments in this PDF-file. We will also be pleased to put together an individual package to suit your requirements. O Grove is a lively small town with approximately 15.000 inhabitants. 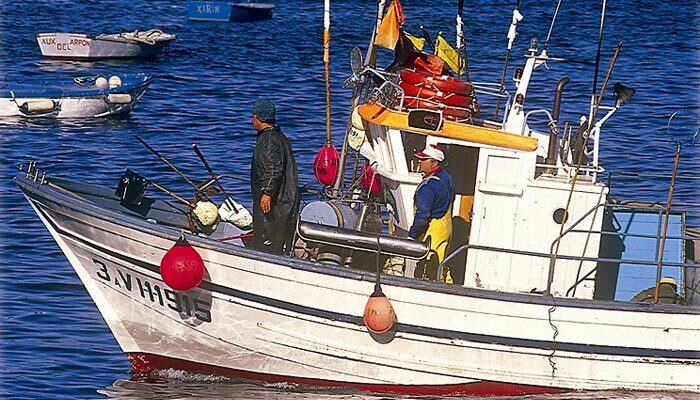 The harbour, with its picturesque fishing boats, is only a short walk away from the school. The school is situated in a building constructed in natural stone, in the traditional Galician style. Inside the building has been extensively renovated and is equipped with modern classrooms, communal facilities and a terrace. The school celebrated its 30th anniversary a little while ago. It has been run from the beginning by a German/Spanish couple, on the one hand very professionally, but at the same time with a very personal, family atmosphere. Outside lesson times the school offers a wide range of cultural and free-time activities. Particularly popular with students are the boat trips past the mussel banks to the beautiful small islands opposite the coast. Intensive and super-intensive courses can be combined with one-to-one lessons. You will find more details in this PDF-file. Courses for students with previous knowledge of Spanish begin every Monday. 08.07., 15.07., 22.07., 29.07., 05.08., 12.08., 19.08., 26.08., 02.09., 09.09., 16.09., 23.09. and 30.09.2019. Lessons are of 45 minutes duration. All levels from Absolute Beginners to Advanced are offered. Minimum age is 16. The Super-intensive course is recognized in many German federal states as “Bildungsurlaub”. All courses include a tour of the O Grove peninsular, giving you a chance to get to know the beaches and the most attractive features of the surrounding area. First course begins 04.03.2019, last course ends 11.10.2019. Courses are from Monday to Friday. Courses booked by a group or one-to-one lessons may take place before or after these dates. Self-catering shared apartments Single or double rooms. Shared use of living room, kitchen and bathroom. Bed linen is provided. Please bring your own towels. Host families Single or double rooms (these can only be booked by two people) with half board. Included in the price are change of bedclothes and towels plus washing once per week. Private apartment If you would like to be more independent and would prefer more comfortable accommodation we will be pleased to book a private apartment for you. Please let us know the dates you would like to come and what your individual wishes with regard to accommodation are and we will be happy to make you an individual quote. Arrive Sunday from 12:00, depart Saturday before 12:00. Prices for additional days’ stay available on enquiry. All accommodation is within 15 minutes walking distance from the school. You will find details of private lessons in this PDF-file. We will also be pleased to put together an individual package to suit your requirements. High season: in the period from 30.06. to 24.08.2019 there will be a surplus charge of 10 Euros per week for accommodation (maximum: 40 Euros).